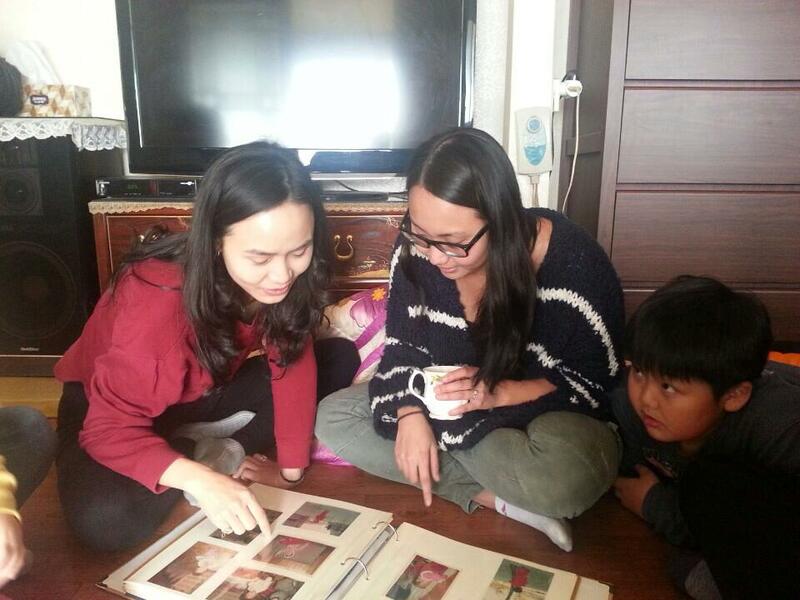 When my sisters, birth mother, and I walked into the office of Jeon Ye Hwan, the ESWS director, the first thing she asked me was for my photo album. Apparently, it’s an unspoken rule that when you reunite with your birth family, you bring a photo album of your childhood memories. When I graduated college, my mom had a video made with all her favorite pictures of me, including clips of my various musical performances and important moments. I decided that instead of lugging an album in my already tight suitcase, I’d be tech savvy and bring the video on a USB drive that they could keep and share. We barely got to the photo montage of my awkward high school years (think overplucked eyebrows and overfed stomach), set to the tune of a recorded choir rehearsal session from when I sang “I’m Beginning to See the Light” accompanied by our high school jazz band, when I stopped the video. Kyung-mi had returned to her seat. The sisters held each other, and I wondered how many times they had been in that same embrace, consoling one another because of the pain my birth father inflicted upon them. The director spoke to my sisters and birth mother for a time and then turned to me for interpretation. I learned the truth about my birth father’s death– which I had been told was caused by his complications with diabetes, but in actuality was drug-related while he was imprisoned. Kyung-hee explained the circumstances that led her to live with my birth father, his mother, and mistress while she was growing up. Kyung-mi was raised by my birth mother’s mother. Jeon Ye Hwan tried to illustrate Kyung-hee’s living conditions for me. My birth father was cruel and uncaring– even when Kyung-hee was just a young girl, she was forced to cook and clean for the entire household. He made her wash the dishes outside in the cold of winter to the point where her hands bled. I watched Kyung-hee as she lightly stroked the knuckles of her left hand with the right as she spoke. It was so difficult to imagine those beautiful, dainty hands as they were when she was a child. The next day, when we had arrived at my house of my halmoni (grandmother), where she lives with my birth mother, aunt, and younger brother, my sisters brought out the photo album from their childhoods to share with me. My birth father used to be a photographer. He had owned a successful camera store until he met his mistress and had to close the shop due to his squandered money. The album was filled with photos of Kyung-mi as an infant and young child. There were photos of my birth mother and birth father in their younger days, looking youthful and happy– as if it were the cover of a Korean DVD. We flipped through pages and pages from this brief era. I looked up at Kyung-hee and asked to see the pictures of her. We look so similar, that I was dying to see if we had looked identical as young children, too. I thought of my dad and how he had spent 6 months looking for cars with me before we found the perfect one. He keeps my senior photo, where I’m seated in the convertible, in his wallet at all times. It reminds us both of the special times we shared going from dealership to dealership, and the lucky break he found in the newspaper classifieds section– just as I had given up hope of finding my dream car. To this day, he still checks the oil in my car and fills the gas tank whenever I go home. Very kindly. Kyung-hee pulled a photo out of the album and handed it to me. It was my birth father at a party of some sort. “This is your birthday,” she informed me. I thought maybe she was mistranslating something. But then she explained that my birth mother remembers this day, and how my birth father dropped her off at the hospital and left her to go to a party. She had never given birth in a hospital, but she experienced unusual pains with me and had to be taken there. She was terrified and alone. And he was having his picture taken at this party. I held the photo in disbelief. This is my birthday. Emotionally shaken with no way to express to Kyung-hee the pain I felt for what she experienced, and the childhood memories she lacked, I decided it would be a good time to lighten the mood and hand out presents. For my niece, I brought a Disney princess nightgown, doll, and Strawberry Shortcake tote bag. My nephew immediately tried on all the hats I brought him that my husband had designed. “Very favorite!” he told me as he modeled his Superman logo snapback. I gave my sisters Bath & Body Works lotions and vitamins (strange, but that’s what everyone in the adoptee forums told me to bring). For my birth mother, I had purchased a necklace from James Avery in the shape of Texas, with a heart cutout to indicate Dallas. She cried as my sister put it around her neck. It was then that I remembered another gift I had for them. A hardcover photobook that my darling Stepfather-in-law had designed and ordered. Filled with photos chronicling the 2+ years Holden and I had dated and become engaged in. He captioned the photos with lyrics of love songs and used Google Translate to include versions in Korean for them to read. My birth mother stared at each page for what seemed like hours. The woman who was too ashamed to look me in the eye and terrified to touch me, smiled ear to ear while looking through the images. How could her reaction be so different to this book than it was when we watched the video? And then I realized… she looked at these pictures of Holden and I and recognized me. They weren’t photographs of the daughter whose childhood she missed, but the one who flew over the ocean to meet her and was seated across the floor. It was a painful realization for all of us. No amount of time together now will ever replace the years we missed. The happier I was without them, the more guilt and shame they felt for not contributing to that happiness. In trying to show them how wonderful my adoptive parents are, my sisters were reminded how awful their father was when they were growing up and what my birth mother was unable to give them because of the hardships she faced. This is why my sister’s visit is so meaningful to me. Though the birth search was initially difficult for my parents to understand, now that I’ve found my birth family, I know that they are no longer afraid of losing me, but ecstatic to have gained more family themselves. My mom will get to live vicariously and buy Christmas presents for my niece, when she knows it’s going to be a long time before I have kids myself. And I am sure that my dad will feel instantly as connected to my sister as I did, because she looks so much like me– and treat her “kindly” as she has always deserved. In the few weeks that she’s here, we will take so many photos that they fill up all the albums that were missing from her childhood. And perhaps someday, my birth family will be able to watch the graduation video and be filled with laughter at seeing my awkward high school phase, instead of the deep sadness that can never be fully healed.